CTD stands for conductivity, temperature and depth. These terms refer to the changing seawater characteristics that the CTD array encounters as it descends. It electrically sends continuous measurements back to the ship. Conductivity is an electrical measurement of salinity. The salinity varies near the surface, but is a reliable 34 to 35 parts per thousand for most of the descent. The seawater temperature drops to about 3 degrees Celsius, about 37 degrees Fahrenheit. 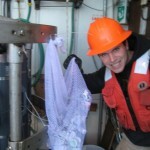 We dropped the cabled CTD to just above the seafloor depth of 1500 meters (4921 feet). The pressure increases about one atmosphere for every 10 meters (or ~33 feet) of depth. 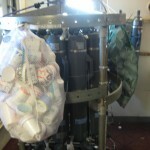 We attached to the CTD array two nylon bags filled with Styrofoam cups, decorated by students from the Lincoln County School District. When subjected to pressure 150 times greater than standard atmospheric, the air is squeezed out from the Styrofoam. The students have a few questions…. 1. How long were the cups underwater? 2. What was the temperature of the water at the lowest depth? 3. 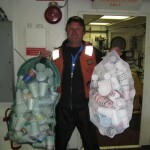 How far offshore were you when the cups were deployed? The cups were underwater about a half an hour. The temperature down there is about 3 degrees C.